On August 1, 1990 Dr. Ng Pock Too was named CEO of Sembawang Engineering Group, a large Singapore government-owned offshore engineering company. He remembers that day well: it was the same day that Saddam Hussein invaded Kuwait and seized their oil fields in the Persian Gulf which would disrupt the world supply lines for oil. Dr. Ng had 23 Singapore engineers working on an oil production platform in the Persian Gulf located in Iranian waters on a contract to upgrade the drilling systems for a major US oil-drilling contractor. They had one month to complete the job, war was imminent, and the families of the engineers were calling upon him to evacuate the platform. This crisis tested Dr. Ng’s leadership skills and mental stamina to manage and resolve tough situations. The challenges he faced during this crisis, the decisions he made and the eventual outcomes are the subject of case studies he will be facilitating this week with MBA students in UNB’s strategic management class. Dr. Ng is visiting UNB’s faculty of business administration as executive-in-residence, the second time in two years he has filled this role. During his presentations, he will be challenging students to consider what they would do if they had been in his position. UNB’s executive-in-residence program augments students’ classroom learning by bringing experienced business leaders into the business faculty to share their real life experiences. In addition to sharing his experiences during desert storm, Dr. Ng will be sharing the first-hand leadership lessons he learned from former US Secretary of State, Colin Powell, during a training session he took part in. Born and raised in Singapore, Dr. Ng came to UNB to study mechanical engineering in the 1960s. After completing his bachelor of science in mechanical engineering in 1968, he returned to Singapore and worked for the government as a civil servant dealing with economic development. He was elected as a member of parliament, served as political secretary to Prime Minister Lee Kuan Yew, and he later served in the National Trades Union Congress as a trade union leader. He left the political scene to serve as CEO of the Sembawang Engineering Group and subsequently became the president for Asia Pacific of Hamilton Sundstrand, a United Technologies Company. 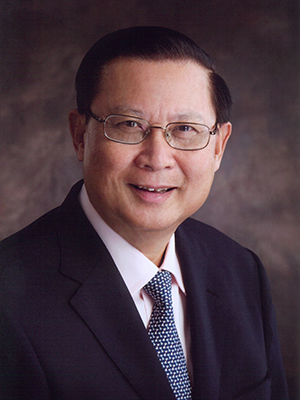 Since retiring in 2007 he has been an adjunct professor with the National University of Singapore Lee Kuan Yew School of Public Policy and is chairman and CEO of New Board Technology Ptd Ltd.
UNB awarded Dr. Ng an honorary doctorate of law degree in 1993 to recognize his contribution to Singapore’s successful economic development. Dr. Ng will be attending UNB’s 27th Annual Business Awards Dinner on Thursday Nov. 27 to accept a certificate of appreciation from the faculty of business administration – an award that recognizes the contributions he has made to the leadership training of UNB’s business students.